It's taken a fair amount of work and a lot of debating, but this issue's Gear Of The Year cover feature has certainly been a lot of fun to put together. We get so much music and production gear passing through FM HQ that it's often easy to forget about the last great instrument, effect or studio tool the moment something else exciting arrives to distract you. So it's always great to get a chance to revisit the cream of the crop once the dust has settled. This issue is about more than just letting the FM team have another go on their favourite toys though. 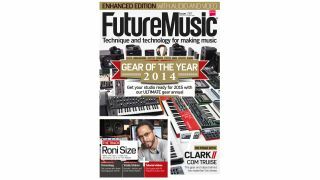 We've meticulously retested and reappraised the year's best instruments, effects, software and production gear in order to bring you our definitive guide to the most inspiring, exciting and essential tools you need to be adding to your studio in 2015. From synths to samplers, drum machines to DAWs, mics, monitors, plug-ins, effects and more. The ultimate guide to studio and production gear in 2014. Droneology - Sick of the same old pads and atmospheres? Add some texture with these warped guitar drones. Totally Shaken - Need some shuffle? Check out this pack of electronic, acoustic and home-made shakers. Minimal Techno - Less is more. Compile yourself some minimal bangers with these beats, hits and loops.